Reliance Fresh, the small-format grocery chain of Reliance Industries, is the latest to join the bandwagon after Foodhall, the Future Group’s premium food chain, forayed into e-grocery. From being dismissive about the online sales, these brick-and-mortar grocery companies are testing the waters. “These are pilots. We have to discover the model and then fine-tune it,” said a Reliance Retail executive without divulging more. “Online is a low-margin business and has a lot of supply chain issues. We do not have immediate plans for food and grocery apart from the Foodhall online ventures,” said Rakesh Biyani, joint managing director of Future Retail. 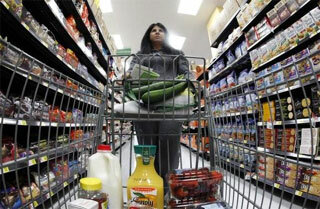 India’s retail spending is $525 billion a year and 66 per cent of this is on groceries. Industry observers said e-grocery was an attractive proposition for all players and Spencers Retail and the Aditya Birla Group could also venture online. “Customers see value in shopping online in terms of saving time and a wider selection of stocks not offered by traditional grocers,” said Ashish Jhalani, founder of eTailing India, an e-commerce knowledge platform. Existing e-grocers, Local Banya, Ekstop and Big Basket, are planning to expand. Ekstop, a Mumbai-focused portal, intends to offer its wares in four cities next year. “We will replicate our model in other cities,” said Sumat Chopra, co-founder and chief executive of Ekstop.com. Chopra said online sales allowed his company to save 30 per cent costs of physical retailing. His 30-month-old portal receives 800-1,000 orders a day, has grown 20-30 per cent over the last quarter, and expects to break even by the middle of next year. has added cut vegetables and baked food to its assortment. “The big challenge is getting good suppliers for fresh produce and maintaining quality and delivery on time,” said Vipul Parekh, co-founder of Big Basket. Last month, Big Basket raised Rs 200 crore from venture funds Helion Advisors and Zodius Capital. This is where, experts said, brick-and-mortar players stood to gain. “Going online is the next logical step for physical retailers. Given their local presence, they can easily look at it,” said Arvind Singhal, chairman of Technopak. India has almost 30 million online shoppers and a large chunk of them live in towns. Over the past five years these shoppers have begun to appreciate the obvious benefits of e-commerce: convenience, choice and competitive prices. “Buying groceries eats up four hours of a homemaker’s time and shoppers are seeking more value from their time. Local Banya is responding to this need and most modern trade players will soon figure out a way to tap into this opportunity. Once we feel that the core of our business has been accepted we will look at diversification,” said a spokesperson for Local Banya. Local Banya is racing towards an annual turnover of Rs 30 crore (Rs 300 million), growing 10-20 per cent per month on festivals and a good season. The portal serves Mumbai, Thane and Navi Mumbai, and is looking at expanding to at least five new cities soon. “Catering to eating habits in every city is unique. Expanding into another city is like starting the business from scratch,” the Local Banya spokesperson said. Selling grocery online has its share of challenges though, the biggest being the need to have a separate supply chain. Parekh said the online formats of the Reliance and Future groups would need separate warehouses in each city. “Supplying from stores is tricky. It is difficult to decide which store to supply from and whether that store has enough stock,” he added. “They should have separate online supply chains. It will take a lot of effort,” Parekh said. "Any physical retailer getting into this business has to build scale separately. It is not plug-and-play with existing stores,” said Chopra.